On Thursday, April 27, NYU Accra students had the opportunity to engage in a lively discussion via the NYU Accra Conversation Series. The topic for the event was “Inside out: Conversation with a Contemporary Ghanaian Musician.” The lead discussant was Reggie Rockstone, one of Ghana’s finest rap artists who is often referred to as the ‘Godfather of Ghanaian Hiplife’. 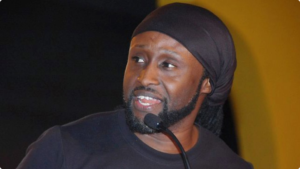 He is believed to have pioneered the Hiplife Art form and has played an important role in the development of this uniquely African genre. He raps both in English and in Twi. Both Reggie and the students enjoyed the opportunity to connect and converse.